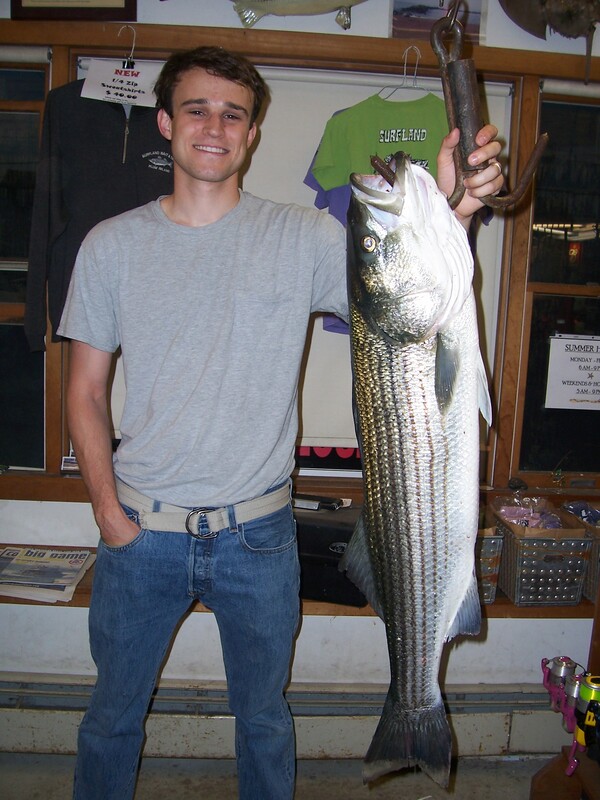 Well our English import that has unfortunately been dubbed “Skate Slayer” caught himself a Striped Bass last night. Jamie Grahm (real name) from Haverhill came into the shop at about 7:30 pm, hung about for a few minutes getting some info, bought some clams and heading to the river for the outgoing tide. An hour later he was calling us to report his catch and headed down to get his fish weighed in. This beauty weighed in at 18-8 pounds. Cograts Skatey, oh, and congrats on “Little Skate Slayer” coming your way!!! BTW, where’s that father-in-law of yours??? 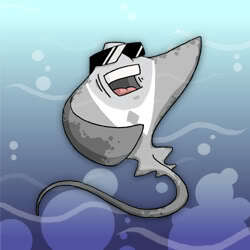 He’ll be jealous now…………………..
Jamie left a happy skate slayer…………. 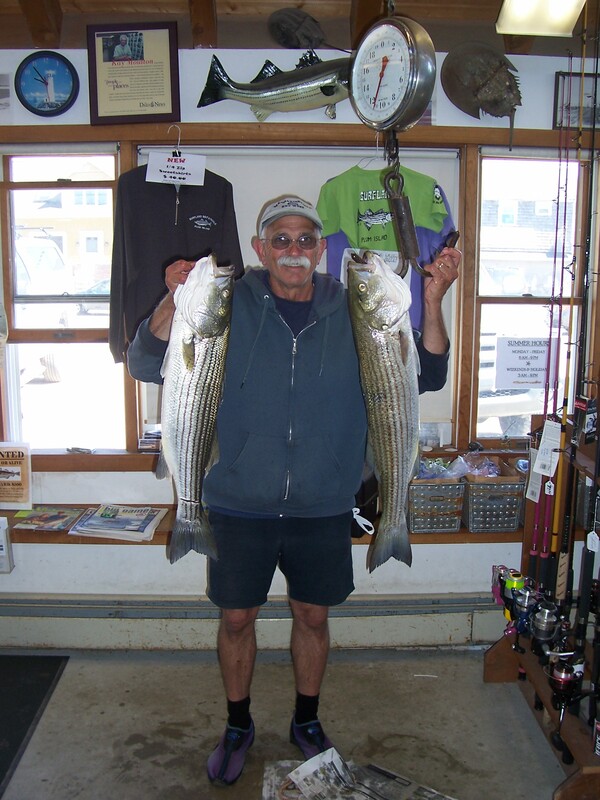 Also a local islander, John Fichera headed out in his boat yesterday morning and returned with two fish for dinner. John was using herring inside the river. Also a little something for you fly fishermen. We had an angler in who was on the oceanfront catching a lot of “schoolies” so he decided he would have a great time using his fly rod on these little guys. Well next thing he knew, he had hooked into a 44″ striper. He had a blast!!! Still waiting for the flounder……………………………in any abundance. And, for those of you that are following the Nate story. This article is in the local paper today. We are having a huge fundraiser next friday the 17th of June. Hope some of you can make it. Surfland will be well represented with a custom rod built by Mike MacCormack, a Penn reel, some other nice fishing tackle that has been donated for the cause. (we will also be having our own rafle for another custom surf rod soon so look for it soon! )There will also be a 14′ Jon Boat up for auction donated by Riverfront Marine. We have signed up a few local fishermen to get clipped. John Noonan has graciously signed on to get his locks shaved off. And our very own James (Stickman) Waldron will be loosing his hair also!!! James is also the creator of our website and also handles a lot of the reports. Pledges for Sticky are being accepted at Surfland. Thank you for supporting this wonderful cause. P.S. More t-shirts so in by the end of the week………………..